Another Delightful meal idea for the busy artists! Make this, eat a meal, freeze the rest for later! This is Vegan, but will satisfy even the most carnivorous lumberjack. Best to chose fresh organic ingredients, for health and taste! This is a huge quantity for a single person, but a generous portion for an average family's meal. Everytime I make chili, I change the recipe to discover new flavors. I rarely fail, but I've never made a better one than this one! It's like eating a bowl of chili that somehow, has the same appeal to me as Southern-American style BBQ pulled pork with plenty of thick, sweet BBQ sauce. So to be able to re-create this wonder, I'm writing it down, right as I'm eating my first bowl. Drain but do not rinse! The small amount of juice adds body to the texture and flavor! •Large pot with a thick bottom (cooks more evenly). I use my Pressure cooker, without the lid. •regular kitchen wares for cutting and holding the ingredients. Cut carrots in thick slices. Steam carrots until no longer crunchy (still with a bite to it, we don't want mush!). This step cuts your overall cooking time by a lot, and avoids the all-too-common burnt chili at the bottom of the pot. While Carrots are steaming, heat the oil in a cast iron skillet but not hot enough to fume, add the garlic & parsley, stirring occasionaly. Cut mushrooms in slices.When a minute or two has passed, add mushrooms to skillet and cover for about three two minutes, to force a lot of juice out of the mushrooms (they shrink, it's magic!). Cook about two minutes more. When carrots are ready, keep the water for later, put the carrots, with the skillet's content, in the large pot. Do not heat it just yet. Do not wash the skillet, you need it still, and the remaining oil should not go to waste! Chop the onions, add them to the skillet (see?, i told you!) with a splash of oil, and a tablespoon of raw sugar (or maple syrup). Cover for a few minutes to release the juice, then remove lid, cooking some more until the onions are almost caramelized. Put in the big pot. Open all the cans. Drain the beans but do not rinse, the lttle amount of remaining juice adds body, texture and flavor! If you insist on rinsing, at least add an extra splash of oil to the pot later. Put beans, tomatoes & tomato paste in the pot..
Heat the pot at medium. Stir well. Add Molasses & apple cider vinegar and stir even more. If the mixture is too thick, add a touch of the carrot-steaming water (nutrients inside!) Careful, some of the juices will be released soon, and could make your chili into a soup! At this point I taste the result, salt to taste, add more vinegar if needed for a tangier taste, and add Paprika, sea salt & the chipotle hot sauce until I get the wonderful sweet-spicy BBQ sauce I'm after. The Chipotle sauce is the magic maker here, adding both spicyness and SMOKYNESS. You could use other pepper-based hot sauces, but it just won't be the same! Maybe adding a bit of liquid smoke could compensate? 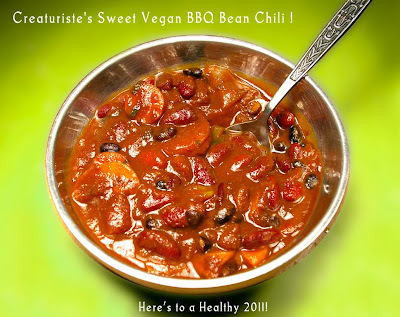 Since this is made from canned beans, all the beans are already cooked, so PLEASE, avoid overcooking the chili. You'd lose flavor and lots of nutrients! We cook it mostly to finish cooking the mushrooms, and blend all the flavors together. Like a lot of chili recipes, this will likely taste even better the second time you serve it, after it has been in the fridge. One of the mysteries of the universe! On an unusually busy week where shopping & cooking are out of the question, I can eat this every day, without getting tired of it. Freeze some portions of it to make the joy last! Better yet, spread the LOVE and offer it to friends and family! I use it in a lot of dishes, including rice, pasta, eggs, and it adds LIFE to an otherwise OK homemade pizza. Just add a few drops evenly over the cheese before baking. Careful, this is sweet and doesn't seem to be as spicy as it actually is. You can overdose on it and cause discomfort to your innards. I sure have! Now if you'll excuse me, I WANT a second bowl of that dangerously good dish.